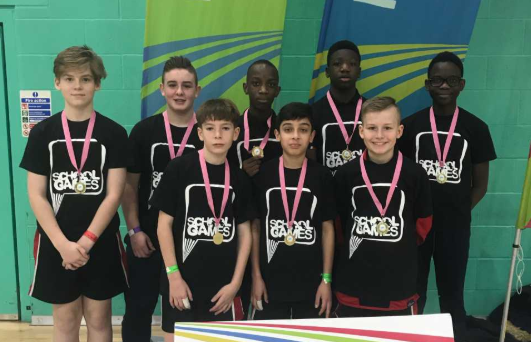 Holcombe Grammar School secured their place at the Handball Southern Regional Finals last week as they triumphed at the U13 Kent schools Handball Tournament. Year 8 students from the school maintained their outstanding record of being undefeated as they won 2 of the 3 games played, before drawing in their final match. Leo Nordkvist and Elisha Babayemi displayed their impressive defence skills particularly against the Dover Grammar Schools for Boys team. Brent Varrall and Matthew Olorunlogbun also demonstrated strong goal scoring techniques throughout the matches. Following the group stages, teams faced the tense knock-out rounds. Holcombe Grammar triumphed against Canterbury High School, proven their ability to work as a team as they progressed into the final with a 2-1 victory! The team’s final opponent was the Harvey Grammar School, Amon Ra-Mesoirisa’s slick dribbling skills opened up opportunities for his team mates to fire many points to secure their place in the Handball Southern Regional Finals! The Holcombe team displayed great maturity and team spirt throughout the competition. The team’s hard work and persistence, has lead the boys to win two handball competitions in a row, to advance to the Southern Region Finals to play on behalf of Kent. The pupils are a great exemplar for the school with both their attitude and skills. The finals will take place in Surrey during May 2019.